Lately I've been taking panoramas of places near home. This is from the bridge to Anna Maria Island and is four images taken side-by-side and then stitched together. Actually I took six images but the full length is too long for social media. The images are taken in portrait mode meaning I held the camera on its side. The result is that there is a lot of detail, so much that you can zoom in to see a little things you wouldn't normally see in a photo. The main reason for doing this is because the print resolution is so good. I love looking at panoramas displayed on walls. It invites you to get right up close and experience the image in a more personal way. But it is a physical medium, not necessarily a good fit for social media. All that aside, as you can see this was near sunset on a cloudy day and all kinds of strange things happened with the light and how it played out on the water. Funny thing is, had it not been a panorama I might not have even noticed all that detail. As is normally the case, I had no idea where I was going. All I knew was that it was before dawn on a Saturday and I was driving somewhere to take a picture of something yet to be determined. It's not a very exact plan but sometimes that's just how I roll. Often I have no idea where I'm going when I go out to take pictures. Instead of turning left I turn right and just go with the flow of random-ness in the universe. I ended up outside the gates at Desoto Point looking at rain clouds and trying to remember why this was better than bed. I put on a poncho and walked to the shore. I told myself that once I got there I could turn around and head home knowing that I tried. Standing there in the rain I was grateful for the solitude, and the poncho. About the same time I noticed the clouds starting to break up. Sure enough the clouds parted, the sun rose and I captured the moment with what seemed to me like a bit of luck. I could have left for home before the scene unfolded, or not even walked the trail to the shore. The fact that I did and stayed seemed to me at the moment to be more chance than purpose. That attitude comes from many occasions where it doesn't work out. So I suppose the odds were in my favor this time and I managed to get the shot, even if it was half by chance. 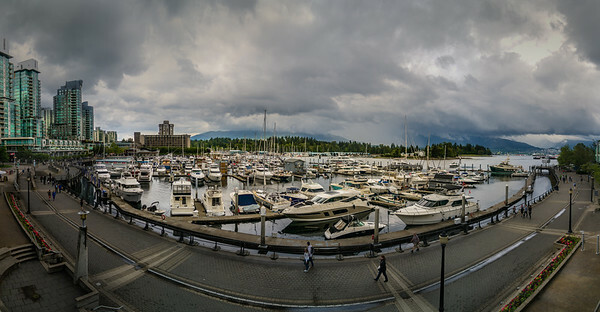 This is a panorama of Coal Harbour in Vancouver. I took this in the middle of summer after a trip to Alaska. When I'm in Vancouver I like to walk along this path. There are always a lot of people out walking, jogging and cycling. Also I think proximity to the water is a good way to clear out the cobwebs. The original image is even wider but I cropped it because I thought it was too wide. This portion is composed of five photos stitched together in Autopano Giga. It's a good tool and once you get the hang of it it's easy to produce panoramas. One thing I like about panoramas like this is the amount of detail. For instance, I've walked by this spot for years and I never noticed the house boats. While processing this photo I zoomed in to take a closer look. Next time I walk by I'll be sure to stop and look again. It's also fun to see what people are doing. Most of them are just walking along and talking with friends. Off to the left is the Weston Hotel, that stands out in my mind because local otters like to use the pool there. How they climb out of the water and find a nearby pool is beyond me. They're smart little critters aren't they? There is always something going on here, always something to see. There are a lot of awesome places in Vancouver but this is one of my favorite. This is a Saturday afternoon in Stanley Park. I was here not too long ago after returning from Alaska. I could have flown straight from Anchorage to Florida, but being so close to Vancouver I couldn't resist a quick weekend stopover. This is a panorama of four images that I stitched together to get a wide perspective. Sometimes I use a wide angle lens, but in other cases I find it works better when I take four vertical images and combine them. For one, the resolution is much higher. That makes it easier to produce large prints. As well, I like to zoom into photos and explore all of the little details. This is the second time I've take an image from this perspective. The first time was several years ago using a wide angle lens. I don't mind repeating myself because as an artist my approach and inclinations change over time. Its fun to go back and play old songs, I hear new things as I grow and evolve. Same goes for photography. Actually I've been redoing a lot of iconic locations lately. Iconic locations resonate in a way that invites new interpretations, new angles, different light. And besides, they are typically fun places to go. So if you see me repeating some old locations, you'll know I'm seeing something different as well as having a good time. 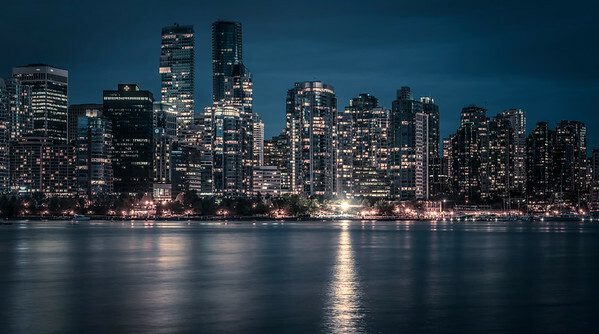 This is a panorama of Vancouver's Coal Harbour. I took this from Stanley Park one night and I wasn't alone. 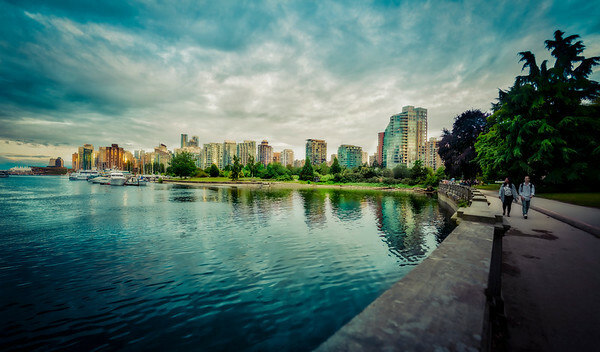 Not only is this a popular spot for photography, Vancouver has a lot of photographers. There were several other photographers out with their tripods composing their shots of this great city. In this case I used three vertical eight-second exposures that I stitched together. I enjoy making panoramas with a full frame camera because of the amount of detail in the image. Whenever I print these I marvel at the smallest details. One reason photography is so fun for me is because I get to go back and look at a scene in quiet contemplation. At the time there may be a lot going on and it's easy to miss things. But I tend to see more things later when looking at images. I'm like a chipmunk gathering acorns of time, holding them and then enjoying them later. Anyway, I almost didn't take this photo because it's been done so many times before. But I'm glad I did, if for no other reason than I get to go back and enjoy the scene now. A couple of weeks ago after some afternoon rain I drove up to Fort DeSoto Park to take photos. As I looked back I noticed this rainbow over the bridge. From where I stood it appeared to span about 8 miles from one side of the Sunshine Skyway to the other. To get this photo I took four vertical images, from left to right and stitched them together to form a panorama. I have mixed feelings about this image. On the one hand the placement of the rainbow over the bridge is nice and if you look close there's even a double rainbow. If I didn't know better I might think it was photoshopped. On the other hand the scene lacks drama. 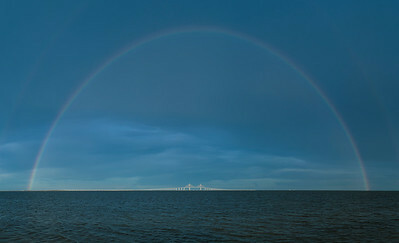 That aside I decided to keep it as is, an image of a rainbow over the bridge without much drama. With some images I take a lot of pains to simplify them in post production. I feel it's important to not have distractions in an image. This one however needed none of that, just water, sky, bridge and a rainbow. Sometimes images like this just demand to left alone because they have a voice all their own. In this case I suppose I have to agree with that. 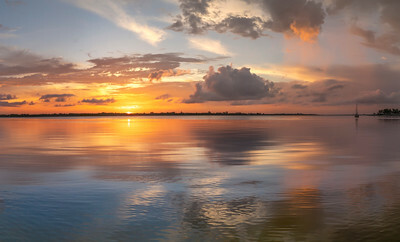 This is a panorama from four images I shot handheld in Bradenton last night. Because I'd been away in Alaska it's been a few weeks since I was here. So camera in one hand and dog leash in the other I proceeded down the riverwalk just before dusk. What I wasn't expecting was the number of people out milling around, there were hundreds, much more than usual. In two words, Pokemon Go. It was an unusual sight, I've never seen anything like it. I felt like I was in some sci-fi flick were everyone was connect to a central brain and I was watching from the outside. But, as I observed, people were talking, walking from place to place, and generally having fun. I thought to myself that these people would otherwise be at home watching TV yet they are out on the riverwalk in the evening. When I stopped to take this picture, several others noticed what I was doing and turned around to take similar photos. They couldn't have done that sitting at home. Maybe because of the game a bunch of folks got outside, mingled, and had a chance to see some things they don't normally see. If it takes a game to do that then hey, why not? 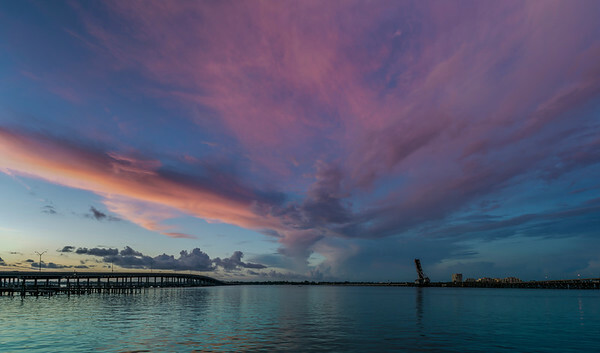 I took this the other night from a bridge that crosses the Manatee River into Bradenton. The river meets the Gulf of Mexico just a few miles beyond and in it's waters are dolphins, manatees and all manner of fish. At this point it's not a river in the traditional sense, more an estuary where the water flows in and out with the tide. The bridge overlooks the Twin Dolphins Marina where folks have pleasure boats. However a number of people live here on their boats full time. There is a restaurant straight ahead called Pier 22 that we frequent on account of the outdoor patio and food which is very good. This is one of those places that I pass when running errands in Bradenton. When I'm driving the bridge I don't get a chance to enjoy the view so much. But today I parked my car and walked across the bridge at sunset. Not surprising, there were a lot of other people walking across for exercise the scenery. Sometimes it pays to just take it slow and enjoy the sights in my own backyard. 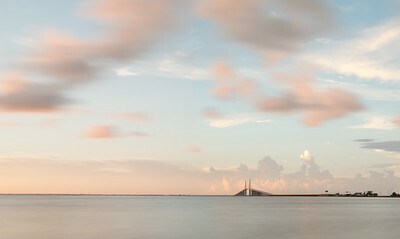 The Sunshine Skyway is almost ten miles long and as you drive across you have great views of the sea and sky. When you are in your car it looks like you are driving into the sky. Maybe that's where it got its name, (that's just a guess on my part). On this morning I came to a little island on the northern stretch to take pictures. In the summer the clouds form large columns that tower miles into the sky. When the sun is low on the horizon the light hits these columns at different angles depending on the elevation. What I notice is that the lower section of the cloud columns have warmer colors whereas those higher up tend to appear white. My guess is there are more particles in the lower atmosphere. In Florida, when you see thunderclouds in the afternoon the variation in colors is hard to miss. In this image the clouds are about fifteen miles in the distance but you can still see the variation in colors. This is another long exposure panorama. It's a thirty-second exposure that I took one morning just after dawn. I stitched two images to create the panorama. This vantage point is about ten minutes from home so it's an easy spot to get to. I had to cross the bridge to get here and then again to get back. I suppose that means I had my head in the clouds at least twice before breakfast. Not an unusual thing for me I suppose. This is the Sarasota Bay Mooring Field. If your anything like me you can be forgiven for not knowing there was a such thing as a mooring field. I just thought it was a bunch of sailboats docked in the bay. Well, well well, ...not so. This is a reservation only mooring by the day, week or longer. I took this photo last weekend. Its is a three image panoramic view by the way, but..., I digress. After processing this image I went to Google Earth to look at it from the sky (so to speak). And much to my surprise this jumble of boats were actually lined up in neat little rows. That got me wondering and then I found they have a web site. 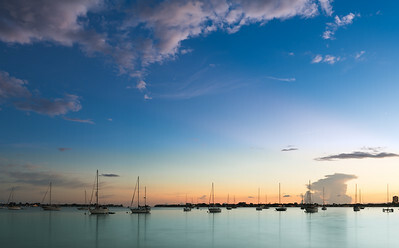 (http://www.marinajacks.com/marina/sarasota-bay-mooring-field.html). And all this time I just thought it was just a random collection of boats. As I stood at the waters edge I could hear people talking and music playing music. In a way it's no different then a campsite on water. There is a little beach where they can park their rowboats and go ashore to get supplies. Not far from here are all kinds of nice restaurants and even a Whole Foods market. With so much choice it seems like a very nice form of camping. Now that I know all this is I feel smarter. All this time I was in the dark. People have been camping and having fun all this time and I thought you had to go to the mountains too camp. Now I know all it takes is a sailboat, a rowboat and a reservation at the mooring field. I'm off to get some marshmallows. 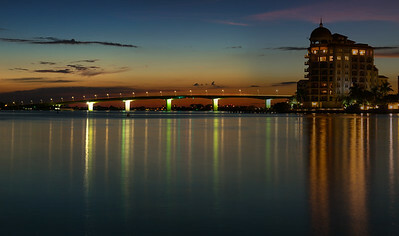 Lights reflecting in Sarasota Bay on a recent evening. I've taken similar images but of course each one is a little different. This is a long exposure panorama of three separate images; the exposure is about ten-seconds and it makes the water look smooth. Panoramas over the water work well only if the water is smooth. Otherwise there are noticeable lines where the wave patterns are stitched together. That's because the waves from each picture are in different positions and don't match when combined. A little tip for the day. I'm addicted to long exposure photography, I love how it transforms a scene, making it seem almost serene. I'm also addicted to night or low light photography, I like how the mood shifts when the bright light of day fades. When I get to combine the two I'm in my happy place. It's a lot of fun and I never quite know what I'll end up with. The main thing is to keep experimenting and, of course, having fun. Anyway, now that the weather here in Florida is finally cooling a bit from the long hot summer, an evening outdoors can be refreshing. A cool dry breeze is something I haven't felt around here in about six months, so now that thats starting I think its time to get out and enjoy the weather. Not that I need an excuse but for me that means doing more long exposure panoramas. Stay tuned, more images to come. This is the city of Toronto just before dawn on a Sunday morning. There's something about the electricity of a city that is attractive, I think it's something in our nature. I used to live here for a dozen years, it was at a time I stopped doing photography, now when I go back I bring my camera. This spot is just east of the city, I'm sure it's popular with photographers but there were none here at this hour. I guess I was a little lucky with the timing because just as I was finishing up it started raining. Not that I mind a little rain, but being in a deserted industrial site in the rain at this hour is, well, less fun than sitting in a Starbucks with a spiced pumpkin latte. Another good thing about showing up late or early to locations like this, the water is smooth as there are no boats moving about. That creates the smooth reflections which are further enhanced by the long exposure. So despite the cold, the rain and the ungodly hour, this is the perfect time and setting for photography. In fact this is a three image panorama. I took three, eight-second exposures side by side with a tripod and then stitched them together. The end result is a high resolution image that I can enjoy from the comfort of a warm room while sipping a latte and thinking to myself "that's wasn't so bad, was it?" 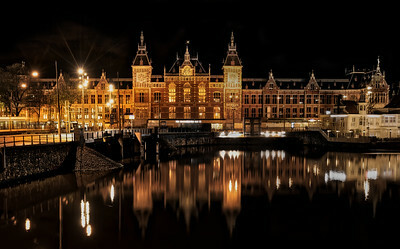 The main train station is known as Amsterdam Centraal, and it was one of the first places I walked to when I arrived from Florida. I was here for the opening of the BTP exhibition and this is where I caught the train to Harderwijk the next day. But as I was still on North American time, I was up late into the night walking around the central district with my camera and tripod. I wasn't sure what to expect but was pleasantly surprised by how many people were out that night walking around the city, to my foreign eyes it was magical, everything I hoped it would be and more. Here I stood on a bridge and captured the train station over the still water of the canal. This is a long exposure three image panorama. As I was taking this I had several people come by and comment on the picture showing on the display at the back of my camera. Actually there were great sights all around me and I was a little like a kid in a candy shop. I'd walk around the canal shooting images in every direction. Finally around two in the morning the long flight started to catchup to me so I headed back. However, even as I walked away rest of Amsterdam showed no signs of slowing down. 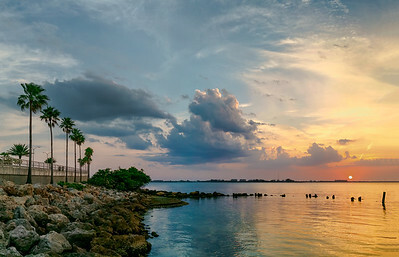 This is a cityscape panorama across Sarasota Bay. To create this I took three vertical images using a 55 mm lens and then stitched them together in Autopano Giga. The reason I did that rather than use a wide angle lens is it creates a realistic view of the scene whereas wide angle lenses tend to distort the sky. Each method has its use. My guess is that these sailboats are in a mooring field. There is another mooring field on the other side of that bridge just out of sight. That one is busy but this one seems to be long term as I've seen the same sailboats sit here for years. The day was a little hazy but the clouds added an extra dimension to the sky. These types of scenes, urban panoramas across the water, represent a technique I find appealing. Sky and water frame a cityscape and create a different perspective. It's a little like looking down from an airplane only in this case we're looking across. I have a coffee table book I'm working on called Sea and Sky; it has a few images like this. Another thing I like about these stitched-together panoramas is that the image is very high resolution. That's good for two reasons; it allows the viewer to zoom in and explore the details and, it can be used to create large prints. This resolution of this image can produce a print that is six feet across without losing detail. That makes it suited for large spaces like offices or hallways. In a few years camera sensors will capture more detail than they do today. Actually these already exist but are specialized for surveillance and mapping. However soon even landscape photographers like myself will have them. And when that happens we'll be able to pass the time just exploring the details of a scene like this on someone's large wall. I was a little lucky to capture this Miami sunrise panorama. We had just docked at the port of Miami after a weekend in the Bahamas. Because we docked at the last terminal it afforded this unique perspective of the city to the west and South Beach to the east. South Beach faces the Atlantic and so the sun is rising over the ocean. Regarding that, I was looking at this picture and wondering to myself why the sun was rising over the ocean? In all my photos from the west coast of Florida the sun sets on the ocean. I realized of course that this is the east coast and, I live on the west coast facing the other direction. Sometimes I get disoriented when traveling. I grew up in the California Valley and I could always orient myself with the Sierra Nevada Mountains; they lie to the east. Out of habit, when traveling I try to orient to some elevated landmark. But Florida is flat so I rely on the sun for bearings. Naturally it seemed to me the sun was rising in the wrong place. At least that’s my excuse for now. Because this is made up of multiple shots stitched together the resolution is very high. This prints out at about six feet by two feet at full resolution. That allows for details not possible with a single frame. It's little like standing in the deck of the ship with binoculars and looking out, only in this case I used a high-resolution camera and a lucky perspective. On the weekend we decided to head to Sarasota for dinner and I had a vague thought to grab the camera. On the way to St Armand’s Circle we saw this scene as we approached the bridge. Since I had my camera I pulled over to capture the sun nearing the horizon. Although it looks white here, the sun was glowing red from behind what appeared to be atmospheric dust. Every so often dust from the Sahara blows across the Atlantic and creates a filter-like effect that’s good for photography. This is another panoramic image. I was using a 35mm lens and took three vertical images and then stitched them together in Lightroom. Unlike the panorama of Miami that I posted yesterday, this does not have as much detail. Nevertheless I am fond of this technique for capturing landscapes because it produces very little distortion. It’s similar to turning your head from side to side. I get a little wistful when I see a sunset and don't have a camera. So I’ve gotten in the habit of carrying one even if I don’t plan on talking pictures. You never can tell when something might come up. If I use a small prime lens then the camera is not so bulky. Then, if I feel I need to go wider than the lens allows, I can simply create a panorama with as little as two side-by-side images. Anyway, this is my favorite location to take photos in Sarasota and I had it in the back of my mind that I might see something as we dove by. I'm glad I listened to that little voice in my head. Hopefully I'll keep listening. I'm originally from California but I lived in Canada for a while. During the long cold winter I imagined what it would be like to live in Florida. This image of Venice Florida is a close approximation of how I envisioned it. Condos on a long sandy beach seem like an antidote for gloominess. It’s no wonder people come down here for a change of scenery. This is another panorama; I’ve been doing a lot of these lately. This one is composed of four images, two on the left and two on the right. Each side has one stacked on top of the other. I used a 50mm prime lens so the detail is very good. Because this is a more complex image, I used a tool called Autopano Giga to stitch it together. 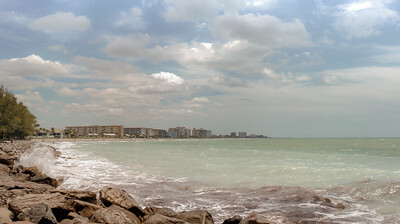 In general seascape panoramas can be difficult on account of the movement of the waves, but it worked out well this time. Getting back to the main subject, while living in Canada I read the John Updike Rabbit novels. In the final installment, Rabbit at Rest, the main character retires from Pennsylvania to a condo in Florida. It was a while ago and I don't remember all the details, but this is the image of Florida I had in my mind. Of course that was a while ago and now, by a long and winding road, I ended up here myself, although not retired. Nevertheless I have the chance to see for myself all these condos on the water. And every time I see some retired gentleman I think of Rabbit at Rest. I guess I'll have to reread the book now. 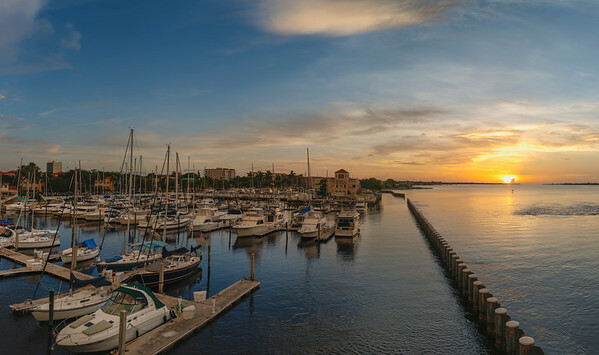 This is a panorama of the Sarasota waterfront. This section is known as Marina Jacks and is the main marina in town. If you want to take a fishing tour or sunset cruise, this is the spot. I've done both from here and it never gets old. I'm going to come back here, this weekend perhaps, and get the same scene at sunrise; this was closer to dusk. As with many of my panoramas I’ve combined several photos so that the resolution is higher than a normal, enough to see very small details. For example, if you zoom in you can see the baseball game on the TV inside the restaurant on the left. That’s perhaps way too much detail, but I think it's cool nonetheless. In a panorama the view sweeps from one side to the other. There is something epic about the perspective; it gives you a sense of scale. Anyway, this is one way to capture the waterfront without taking a shot from an aircraft or drone. I was walking my dog when I took this. I held the leash in one hand and the camera in the other and took five images from left to right; no tripod was involved. That says more about the capabilities of the Sony camera than it does about my camera holding skills. It’s perhaps not the best way to go about it but the dog needed a walk and I needed a picture, so we compromised. In the end we both got what we wanted. Over the weekend we had a full moon and for some reason it’s called the strawberry moon. Apparently it’s the smallest full moon of the year, but I think that doesn’t means much in practical terms because we can’t see the difference with our eyes. This is the Sarasota skyline from across the bay. It was one of the few nights we didn’t have cloud cover and this scene is one I’ve been waiting to capture. In fact this is a large panorama consisting of twelve individual images in a grid of 2 x 6. At full resolution this is two by eight feet. 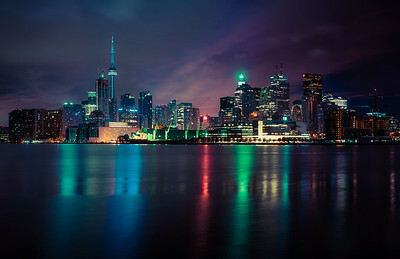 If you are thinking of purchasing a print, be sure to select the wide panorama crop (20 x 80 or similar) when checking out or just contact me so that I can ensure you get the correct fit for the frame size you want. I’ve been creating a lot of panoramas lately. I’m intrigued by the perspective and level of detail that’s possible. However the bigger the panorama the harder it is to put together. There are a lot of nuances that need to be fit just so. The software helps a little but most of the work is slow detail effort, although it’s something I enjoy a lot. The long slow process in kind of like a meditation for me, I’m in a different world when editing images. I spend more time working on photos than taking them. That’s just part of my artistic process. Often I’ll come back to a photo a dozen times before I feel it’s ready. Many times it never gets there and is relegated to the reject bin. Every now and then I review the rejects and see something in a different light and bring it back to life. In this case I had a strong idea of what I wanted so it was just a matter of taking the time to get it just right, in camera and in post processing. After all that work I still don’t know why it’s called a strawberry moon. I should just Google it but on the other hand I think I’ll just leave it as a mystery for now. A few months ago I was in Salt Lake City visiting some close friends. I am not Mormon but my ancestors were and so are my close friends. So while there I took the time to visit the temple grounds and took a tour of the convention center. This panorama I took while standing on the convention center roof. My ancestors were the original settlers of Salt Lake City. So we also visited the cemetery to see where they were buried. Through help from my friends and a little sleuthing we found the graves where my great-great grandparents were buried. They’re in the Salt Lake Cemetery, which is the resting place of many of the original pioneers. It was for me an amazing experience because I came away learning about my heritage that heretofore I’d only heard from my grandmother before she died. It goes without saying the Mormons are big on ancestry and so they were more than happy to help me fill in the gaps. I am fortunate to have such a recorded history and now that I know a little more I’m eager to share it. Back home the other day I was taking some photos along the waterfront. Two Mormon missionaries approached me and rather than ignore them I engaged them in conversation. I pulled out my iPhone and shared this photo and told them about my experience and ancestors. They seemed genuinely surprised to meet me and equally happy to see a picture of their main temple. It was a fun encounter. While I am not planning to convert to the Mormon faith, there are many things we share in common. And for that connection and fellowship I am truly grateful. I just got back from Salt Lake City. It was my first time there and most of the time was spent in the valley or the mountains to the east. However on my last day there were flight delays so I took the opportunity to visit the Great Salt Lake before leaving. This is a midday view of Stansbury Island from a viewing platform at the state marina. The lake is big enough to have several islands that are extensions of the surrounding mountain ranges. I was trying to figure out why it seemed so desolate and then it occurred to me there are no fish in the lake. No fish, no fishermen; it makes for a quiet lake. The lake is a terminus and has no outlet so the water simply evaporates leaving the minerals behind. In some ways it resembles desert filled with water. As such it presents an opportunity to do a study in minimalism, in this case I created a panorama consisting of two side-by-side images. My ancestry goes back to the early settlers of this area. My grandmother used to tell us stories that were passed down to her about the hardships of the early days. My great-great-grandfather was the fellow that first spotted the lake as the early Mormons were looking for a place to settle. So I imagine this is not all that different from what he saw. I wonder if he was disappointed when they realized there were no fish in the lake. My mother grew up here and once told me that you could just float in the water without swimming. I once tried an isolation tank that used salt water. Because the water is so heavy you float without sinking below the surface. It was a feeling of weightlessness; I wonder if the same is true for this lake. I had a short stay here but plan to come back and explore. Salt Lake City is a growing city and surrounded by scenery on all sides. It’s no wonder the pioneers decided to put down roots here. 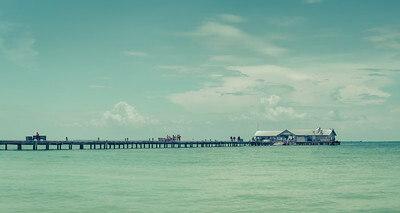 This is a panorama of the pier on Anna Maria Island on another one of my Sunday drives. I take a disproportionate number of photos on Sunday because I usually end up going for a drive. I’ve also been taking a lot of panoramas lately. This one I’ve shortened but it is actually another twenty-five percent wider on the right. It looks better on a wall that way but what you see here is cropped for the web. One thing I will say about Anna Maria Island is how quiet it is. That may seem like an unusual statement for someone living or visiting here, but it’s true. I just got back from New York City and the contrast couldn’t be more apparent. Comparing apples and oranges (pardon the analogy) is not a fair comparison, but take away everything else and you are left with the sounds. Don’t get me wrong, I LOVE New York City. But coming back to Florida after a little visit there reminds me how much I like quiet places as well. Quite frankly I can use a little more New York in my life, but I sure am fortunate to live here in Florida. We have open spaces, sea breezes and the quiet sound of the waves. Now that I got that off my chest, I have half a mind to plan another trip to NYC. But in the meantime I’ll go for Sunday drives and look for scenes like this and listen to the sounds of a tropical island right here in Florida. I took this from Palmetto Florida one evening last summer. There is a lot going on in the sky as an afternoon thunderstorm dissipates over the water. I needed a panorama to capture the expansiveness of the sky. It’s made up of ten photos in two rows so there is a lot more to see than I would get from an ordinary photo. This image is a good representation of what it’s like here in summer. You look one way and it looks dark and ominous, you look another way and it’s a nice sunset. That’s why I used a panorama, so we can see in both directions. But in reality, panoramas are the predecessors of 360 images. With your browser or a VR viewer you can look in any direction. I like still pictures because of the creativity I can put into them. VR is a different thing altogether but they each have their place. Maybe one day all photos will be VR, wouldn’t that be interesting?